Officials say standing for three minutes every day could have significant health benefits. WASHINGTON—As part of an ongoing campaign to promote physical fitness and well- being, the Department of Health and Human Services is urging all Americans to set aside time at least once a day to stand. 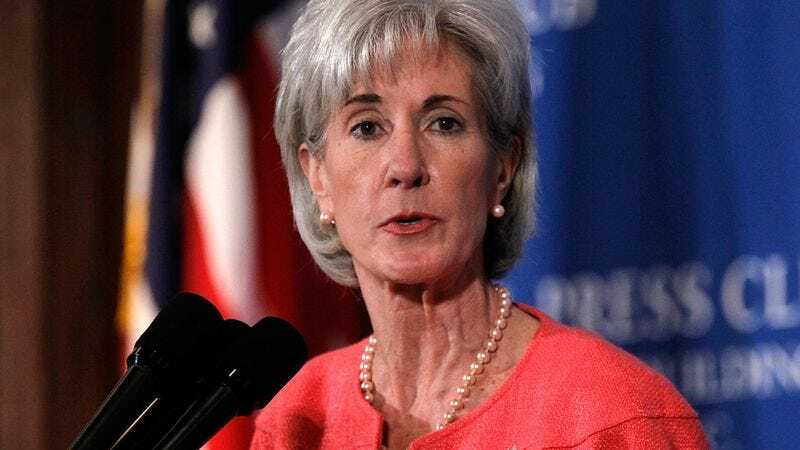 Speaking to reporters Thursday, HHS Secretary Kathleen Sebelius extolled the numerous benefits of regular standing, explaining that it can be central to maintaining a healthy lifestyle. "We recommend placing two feet on the ground shoulder-width apart, straightening out the legs, and then locking the knees to hold an upright position," said Sebelius, adding that just about anyone can start standing regardless of age or prior experience. "Supporting your own weight while keeping your torso erect won't just make you feel better. It will also force much-needed blood to your legs—and the positive effects will continue long after you've sat back down." "So get out there and stand," she continued. "One to two times a day, if possible." In conjunction with the announcement, HHS officials are distributing a free poster to the public with guidelines on how to stand safely and efficiently. The instructions, along with illustrations to show each separate phase of movement, caution beginners to rise slowly, brace against a sturdy object for support, and always be under the supervision of a spotter. While the poster lists as an initial goal the ability to stay up for five seconds, it suggests those who have mastered the basics aim for at least three minutes of moderate standing per session. Advanced standers, classified as those who can easily maintain the position for 10 minutes or more, are urged to also try lifting their arms to eye level and, if they're feeling up to it, taking a step. "We don't want people to push themselves too hard too quickly and get hurt," said HHS Deputy Secretary Bill Corr, noting the importance of saving enough energy to bend one's knees and sit back down. "If done correctly, though, standing can be a fun activity people actually look forward to each day." According to surveys conducted by the Pew Research Center, the number of Americans who stand daily has dropped 32 percent in the past decade. In an effort to reverse the trend, HHS is hoping to increase its education and outreach programs so that the majority of citizens are standing regularly by 2016. Dallas resident Joshua Miller, who recently signed up for a standing class at his local gym, told reporters that while adding a standing regimen to his daily routine has at times been challenging, he believes that he will eventually see results. "You can really feel it in your legs; it's hard work," Miller said. "There are some days when I'm so exhausted that the thought of putting on my clothes and standing just sounds like the last thing in the world I'd want to do, but I try hard to push through. I know the more I stand, the more energy I'll have later on for other things, like eating." HHS officials were also quick to note that proper stretching and breathing techniques should be performed before and after every session in order to avoid common standing- related afflictions such as vertigo and stander's knee.